Film poster for Vanishing Borders. Photo from Alexandra Hidalgo. 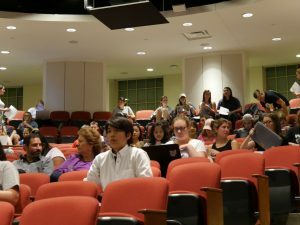 On Wednesday September 21, 2016, filmmaker Alexandra Hidalgo visited Miami University and presented her 2014 documentary Vanishing Borders. 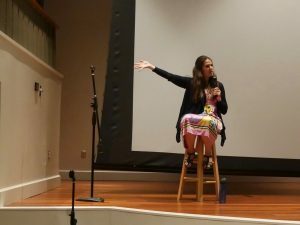 Hidalgo spoke to a class, met with Miami University Art Museum (MUAM) staff and students, presented her film at Wilks Theater in the Armstrong Student Center, and answered questions from the audience following the showing of her film. Hidalgo’s Vanishing Borders is about four immigrant women from around the world who have made their homes in America. Miami University students and community members attended the viewing of “Vanishing Borders” at Wilks Theater in the Armstrong Student Center. Photo by Alexandra Hidalgo. Hidalgo is an immigrant herself. 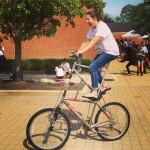 Born in Caracas, Venezuela, she moved to Dayton, Ohio when she was sixteen years old. 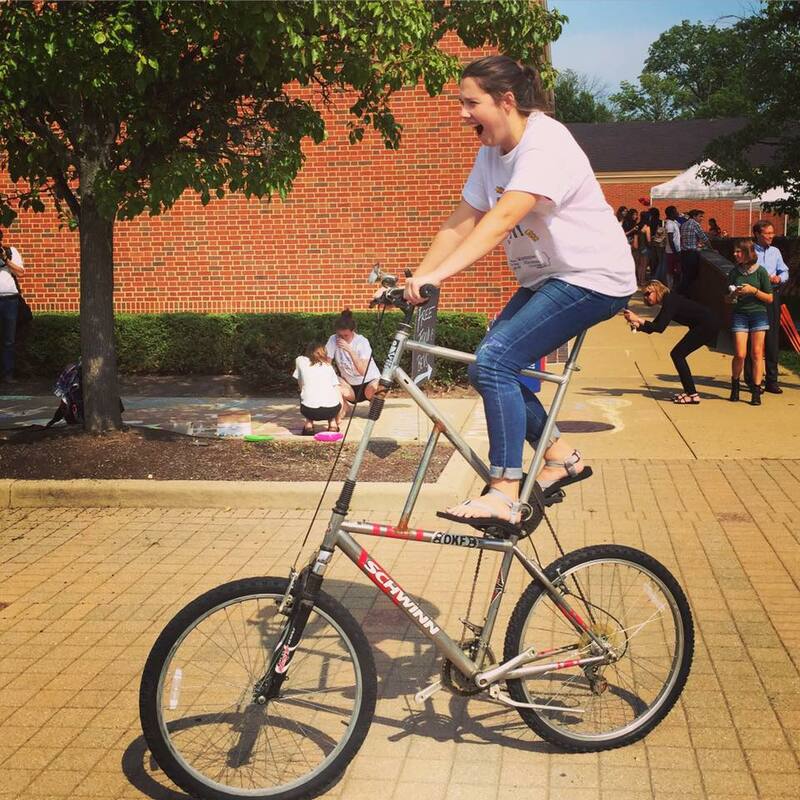 She attended Ohio University, where she earned a B.A. degree in Philosophy. Hidalgo went on to earn an M.F.A. in Creative Writing from Naropa University in Boulder, Colorado and a Ph.D. in English from Purdue University. She is currently an Assistant Professor at Michigan State University in the Department of Writing, Rhetoric, and American Cultures, where she teaches courses in professional writing, film, and video production. To find out more about Hidalgo’s research and film projects, visit her website. 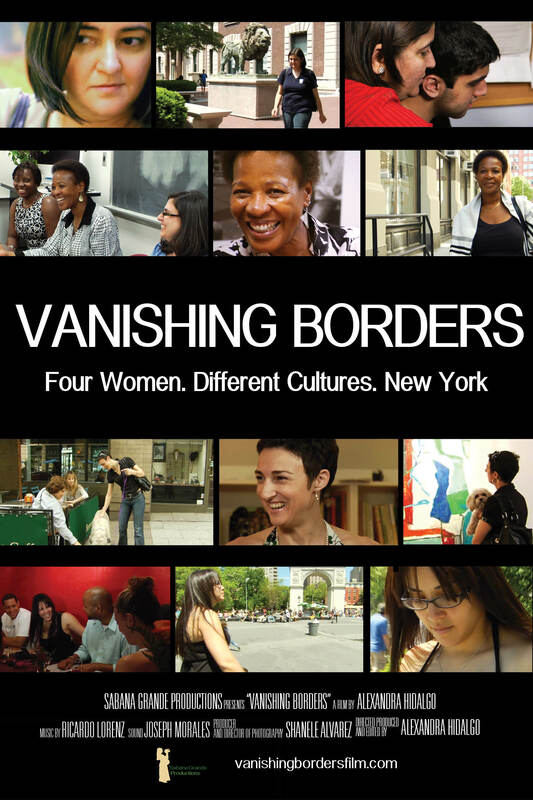 Film poster for “Vanishing Borders.” Photo from Alexandra Hidalgo. The four women chronicled by Hidalgo all live in New York City, and all have advanced academic degrees and successful careers. Hidalgo chose these women from a larger group who she already knew or who she met through mutual friends in New York. The filmmaker chose women who challenged the common perception of immigrant women by highlighting individuals who are educated and independent. Hidalgo records the unique story of each woman, from what their lives were like before they emigrated to the United States to how their freedoms in the U.S. allow them to follow their passions. Each woman expressed how their careers and degrees would not have been possible if they still lived in their home countries. Another theme among the women’s stories is the difficulty of having a changed sense of belonging and balancing their identities. One of the women, Teboho, expresses feeling at home in both the U.S. and her native South Africa. Similarly, Melainie, who came to the U.S. from Australia via Japan, expresses having lost a sense of belonging at home but feels a strong identity in being Australian, and now an American. Filmmaker Alexandra Hidalgo took the stage after her film to answer questions from the audience. Photo from Alexandra Hidalgo. While these stories are always important to hear, Hidalgo raised an interesting point during the Question & Answer portion of Wednesday’s program. She commented that it seems more poignant now, than in 2014 when the film was released, that these stories are heard with the current tensions in our nation surrounding immigration legislation. Knowing these stories turns a group that may be easily generalized into individuals. When we allow ourselves to know about specific individuals, an unknown group seems much less threatening. This point is made by the four women during their discussions, featured in the trailer for Vanishing Borders. 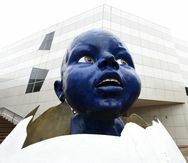 In a similar way, a current exhibition at the Miami University Art Museum exposes individual stories in a powerful way. Artist Carol Hamoy’s Welcome to America, consists of “dresses” that carry the identities of immigrant women, and excerpts from their stories of travel and resettlement. 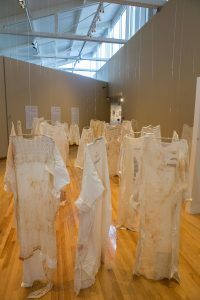 In the Art Museum’s McKie Gallery, visitors can walk through the garments hanging from the ceiling and experience the wide variety of narratives and identities of women immigrants to America. Hamoy’s Welcome to America will be on display at the Miami University Art Museum until December 17, 2016. “Welcome to America'” by Carol Hamoy, currently on display in the McKie Gallery at the Miami University Art Museum. Photo by Scott Kissell. Upcoming programming related to this exhibition includes a visit from the artist herself. Hamoy will offer her lecture, titled “The Complications of Making Art from a Feminist Perspective,” on Thursday October 6 from 5:30–6:45 pm at MUAM. On Tuesday November 8, from 6–7 pm, Dr. Helen Sheumaker, Miami University Professor of History, will present her lecture, “History with Things” at MUAM with a reception beginning at 5 pm. Dr. Fatima Emlemdi, a visiting professor from Libya will moderate a panel, titled “A Conversation: Welcome to America” on Wednesday November 16 from 7–8 pm, with a reception beginning at 6 pm. The panelists will include Esther Berlioz Claros from Honduras, Regina Garcia from Brazil, Silvia Rothschild from Argentina, and Lalita Satyal from India. More information about these events can be found on the Miami University Art Museum website. 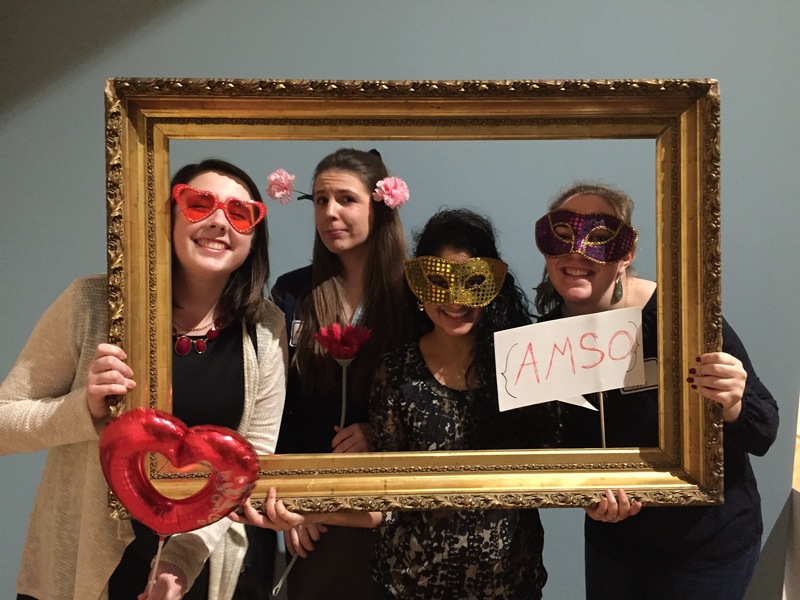 The Miami University Art Museum would like to thank the Art Museum Student Organization (AMSO), the Department of Media, Journalism & Film, the Department of Political Science, the Center for American & World Cultures, and the Department of Sociology and Gerontology for co-sponsoring the viewing of Alexandra Hidalgo’s film Vanishing Borders. We’re Expecting… A Hatched Baby!